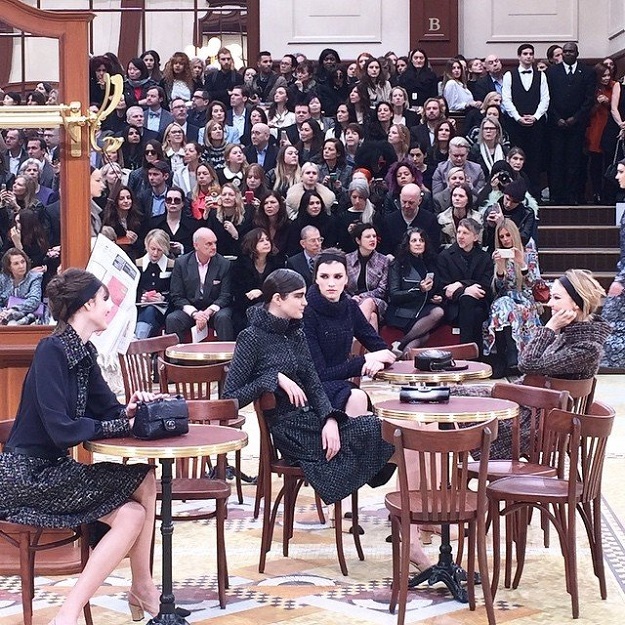 While most of us are just now gearing up for spring, fashion moves at lightning speed and today during Paris Fashion Week Chanel presented its AW 2015 show. Each season the fashion show is held at the Grand Palais in Paris and each season the show is more spectacular than the last – in seasons past Karl Lagerfeld has created everything from a lush tropical garden to the chicest grocery store one could ever shop in and most recently models protesting their right to be chic while waving banners. For the AW 2015 collection Karl Lagerfeld created an epic Parisian dining experience with the Brasserie Gabrielle, featuring traditional red leather booths, small classic Parisian tables with bistro chairs, mosaic floors, and a complete bar, all of which tied together with the Parisians current love affair for the American classic Sunday brunch. 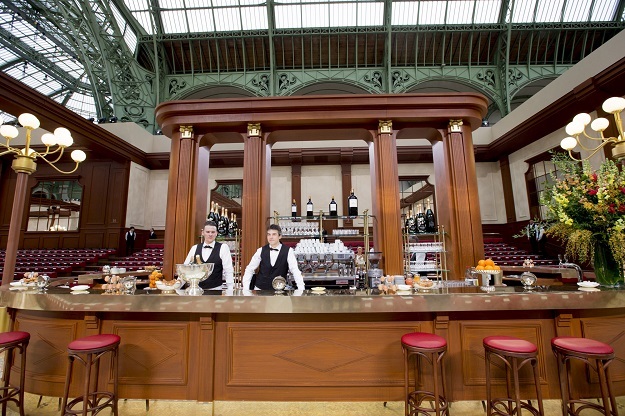 To begin the show the maître d seated each model at either her table to read the paper or sip tea, which included plates with double C insignia on them or at the bar for a glass of grapefruit juice. As each model settled into her location the clothes and accessories were on display while each girl was depicted to just be spending an afternoon at the café with her friends to have a coffee and flirt with the waiters. 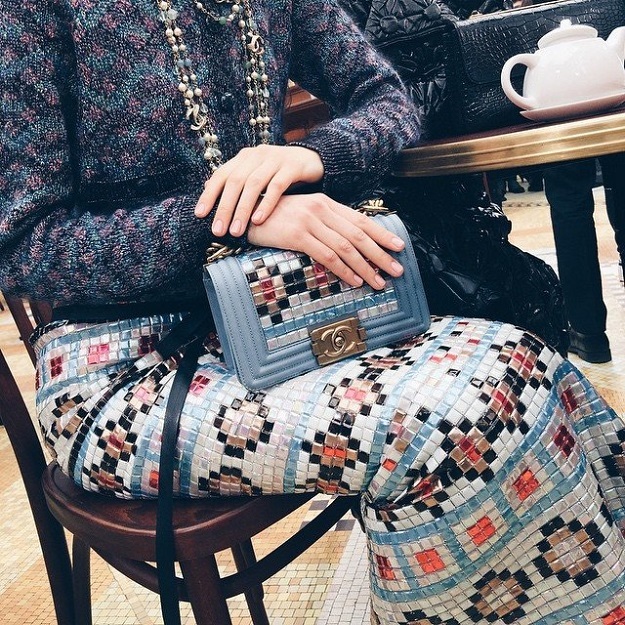 The clothing itself was as glamorous as we would expect of Chanel, but the silhouettes were relaxed with puffy parkas worn over delicate chiffon dresses, along with tweed jackets and a bomber or two thrown in, along with one skirt and quilted bag that were clearly inspired by the mosaic floors of a bygone era. 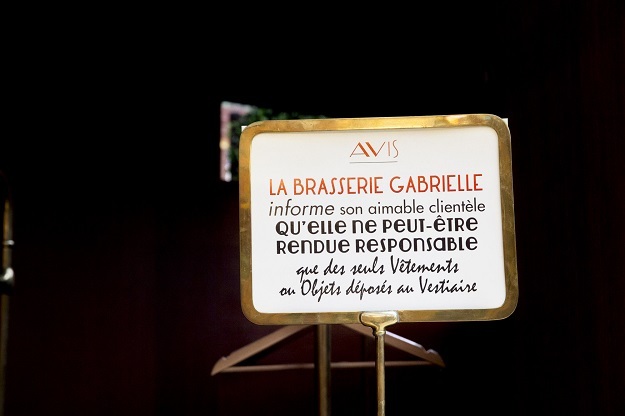 This was the best dressed brunch and the location was obviously the most sought after brunch reservation in Paris. 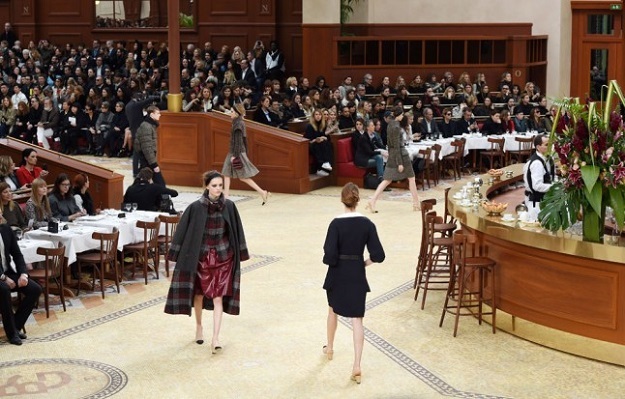 Chanel’s Fall/Winter 2014 Supermarket Fashion Show J. Crew Arrives In Paris Chanel + Girls with Pearls Oh Karl!